Miles Teller isn’t the only actor who could have played Vinny Paz, the real-life boxing champion of Ben Younger’s shamelessly rousing sports drama Bleed For This. You can tell from the obligatory end-credits appearance by the actual Pazienza that Teller’s frame isn’t nearly stocky enough, even after bulking up significantly for the assignment. And the star’s Italian stallion routine, with his blue-collar Rhode Island braggadocio, is a little labored. There is, however, a reason, beyond vague facial resemblance, that Teller nabbed this role, and it becomes abundantly clear around the time that Vinny Paz refuses a sedative from the doctor who’s about to remove the metal screws from his skull. This lightly fictionalized version of the boxer is as stubborn, driven, and masochistic as the entirely fictional drummer Teller memorably portrayed in Whiplash. And even that guy didn’t risk a severed spinal chord to achieve his dreams. Down to Teller, a car crash, and a mutually obsessed mentor figure, Bleed For This is basically an uncritical Whiplash: It sees something inspirational, not psychotic, about its hero’s punishing perseverance, his willingness to put his body through hell for the sake of glory. In 1991, Paz broke his neck in a head-on collision, leaving doctors to conclude that he’d probably never walk again, let alone step back into a ring. The pugilist‘s triumphant return to boxing has been packaged, over the years, as one of the unlikeliest comeback stories in all of athletics. Younger, who wrote as well as directed, sees no need to repackage it. When real life already conforms to the clichés of an underdog crowd-pleaser, the work is done for you. Bleed For This introduces Paz pounding away on an exercise bike to make weight, his ripped body encased in plastic wrap. It’s the late ’80s, and Vinny, having lost a couple of title fights, is already looking like a has-been to some of the boxing world—including manager and promoter Lou Duva (Ted Levine), who declares that The Pazmanian Devil should probably hang up his gloves for good. (If the film didn’t intend us all to boo and hiss this conclusion, it would not have cast Buffalo Bill as the chief naysayer.) Undeterred, Paz instead hooks up with veteran trainer Kevin Rooney (Aaron Eckhart, highly entertaining), whose nuggets of quotable wisdom (“I want you to understand the difference between a risk and a gamble”) help him jump a couple weight classes and grab the Super Middleweight title. Had that been the emotional crescendo of Paz’s career, Bleed For This might still exist. (Sports biopics have worked with less dramatic arcs.) But the film’s true raison d’être is chronicling the aftermath of Paz’s accident, when he ignored the advice of his doctors, friends, and family and started pumping iron again, despite the uncomfortable, limiting iron Halo brace fused to his skull—and the fact, of course, that a false move could have left him paralyzed. Even those who don’t know where this true story is headed could probably trace its trajectory. Not to mix sports metaphors, but the fact the movie culminates with a big fight (against fellow champ Roberto Durán, subject of this year’s other boxing biopic) is par for the course. At least the filmmaker brings a little pizzazz to his assignment. Younger kicked off his career with the Scorsese-indebted financial drama Boiler Room, whose dramatized true story was later adapted into an actual Scorsese movie, The Wolf Of Wall Street. 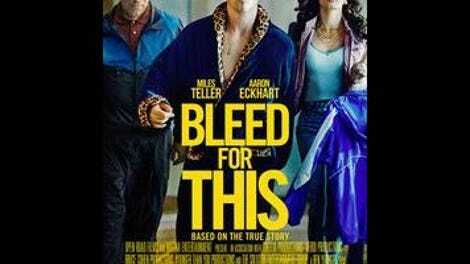 Bleed For This counts the Raging Bull director among its executive producers, which makes it more permissible, perhaps, that Younger cribs heavily from the master’s rock ‘n’ roll playbook, especially during early scenes of Teller swaggering around to choice soundtrack cuts, like the spooky stomp of Willis Earl Beal’s “Too Dry To Cry.” There’s also a touch of The Fighter director David O. Russell in the film’s conception of Paz’s colorful, yammering Italian family, headed by Vinny’s supportive but concerned father, Angelo (Ciarán Hinds). As for the fight scenes, they’re ragged and noisy, Younger going handheld and often shooting the combatants from below the ring, to emphasize their fearsome size. His most effective choice: cutting the music and crowd sounds during one especially brutal match, so all we hear is the fleshy blows. Boxing movies have a built-in appeal, inextricable from that of the sport they depict. Even the bad ones, like last year’s formulaic Southpaw, still give us the primal pleasure of two guys whaling on each other in a ring. But the best ones—like Fat City or Million Dollar Baby or, yes, Raging Bull—are just as fascinating on the other side of the ropes, because they’re really about the pathology of these fighters. Bleed For This looks at Vinny Paz and sees only unshakable determination, and though there’s a certain queasy, even darkly comic thrill to seeing the man (courageously? foolishly?) bench press his injuries away, Teller can’t make much of a character out of nothing but raw conviction and a spectacularly crappy mustache. That his bolted medical headpiece looks a little like a crown of thorns turns out to be rather apropos.